The GIS Technician works under the supervision of the GIS Manager. This position performs technical GIS functions including but not limited to, editing and maintaining data layers, generating maps, data collection, and performing data analyses. Edits and maintains existing datasets in an enterprise geodatabase. Creates features and verifies legal descriptions using coordinate geometry. Generates maps for internal and external customers. Collects data using Trimble mapping grade GPS unit. Current college student or graduate with a major in GIS, Geography, Engineering, Computer Science, Planning, or related field. Must have working knowledge of Esri’s GIS software: ArcGIS Desktop, ArcGIS Pro. Familiarity with Trimble mapping grade GPS unit is preferred. Must possess a valid Utah Driver License. Candidate must be able to pass criminal background check and pre-employment drug screen. At YellowScan we design, develop and produce aerial drone imaging sensor systems for professional applications. Fully integrated, ultra-light and easy to use, these highly automated data collection tools are employed by customers around the world in fields such as surveying, forestry, environmental research, archaeology, industrial inspection, civil engineering and mining. To rapidly develop the activity in the Americas region, YellowScan is actively seeking its Sales Associates for the Americas, with relevant experience in Surveying, Topography; GIS, Civil Engineering, Mining, Forestry, or Environmental Research. Based in Salt Lake City, Utah. May travel up to 2 weeks per quarter. YellowScan, Inc., a US company, is wholly owned by our French parent company, YellowScan, SAS. YellowScan designs, develops, and produces mapping LiDAR systems for commercial unmanned aerial system (UAS) applications. Fully integrated, ultralight, and easy to use, our highly automated products are used by professional users around the world in many engineering and science related fields. Prioritizing the satisfaction of our customers, we are committed to providing the highest performance, quality and reliability of our products and services. To quickly develop our business worldwide with a very high level of quality and services, we actively seek the best talents to strengthen our team. Today we are seeking to add a new Business Development Manager (BDM) to develop and grow our user base in the Latin American region, to include Mexico, Central America, and South America. Experience in one or more of the following sectors: topography, remote sensing/aerial imaging, GIS, Public Works, Mines & quarries, Forestry. • Build a network of resellers in LATAM and drive their sales & marketing teams. Improve their technical and sales knowledge and skills so that they can provide intelligent solutions and continually grow sales and customer satisfaction in their respective regions. • Partner closely with internal teams and coworkers on key sales-related areas including marketing, support, finance, and operational best practices. • Attend industry events and network in the geospatial market to develop our brand and facilitate strategic sales. • Investigate and report regularly on customer needs, market trends, and competitor activities. HDR is looking for an entry level GIS Analyst with a solid understanding of GIS, expertise with Esri software and the ability to combine science, aesthetics, and cartography to communicate spatial information effectively. Duties include working in a professional environment with a team of other analysts and GIS developers, engineers, environmental scientists and planners. The ability to effectively communicate and collaborate with remote team members and with individuals from a wide variety of backgrounds, both technical and non-technical, is required. We are interested in someone who is passionate, self-motivated, and has a strong desire to research, learn and grow as a GIS professional; someone who can appropriately apply technology to solve problems and provide services to our clients. Successful candidates will be able to develop database schemas and analysis methods needed to support project goals and efficiently use web resources to research and problem solve. Our projects include geospatial solutions for desktop, web, and mobile. We know you’ve got skills, and NOW is your chance show them off at the 2019 UGIC Map, App, and poster gallery and competition in Midway, Utah. UGIC 2019 would like to invite YOU to enter this year’s map, app, and poster gallery and competition. Many of us do what we do because we love maps and this is your opportunity to show off your hard work to the greater Utah geospatial community! There will be cash awards in the student categories. CITIZEN ENGAGEMENT – Many of us work to transmit complex information to the public, and it isn’t easy! Show off your best citizen engagement map. UTAH AS ART – Utah is beautiful. Show us your real cartography skills. No limits, but it must be of Utah – other geographies will be appreciated, but disqualified. SMALL MAP – We often have to produce maps that are letter size but must transmit, clearly, efficiently, and accurately, an extensive amount of information. This is your opportunity to show your best 8.5″ x 11″ map. There are no limits to the map topic, but the map must meet the noted dimensions. PROFESSIONAL MAP – This category hosts the best of the best where professionals show us what hey have put together over the past year. STUDENT RESEARCH POSTERS – Not to be confused with a map, POSTERS depict research, methodologies, processes, and efforts generally undertaken via scholastic activities. Putting your best foot forward is important when explaining your research. Posters should clearly present the topic at hand, be readable (visible) from a short distance, and include maps and graphics (of course). INTERACTIVE MAP – Exactly as it states. This MAP should be online, or otherwise digital, and should present information in a unique, clear, and engaging way. If you are submitting an interactive map, you need to provide a single 8.5″ x 11″ paper that contains your name, a title and description of your interactive creation, and a simple URL code (use bit.ly, or similar to create a simple URL – or a scannable QR code will work). BEST OVERALL MAP – By simply entering a MAP or POSTER category, you are competing for the BEST. Keep that in mind! THE STAN McSHINSKY AWARD – The man behind the legend, Stan Mcshinsky, has a category that is worthy only of his namesake. If you think you have what it takes, the creativity, the countless hours, the endurance to create a unique mapping work of art – bring it on. You don’t enter this category, this category finds you. Bring your hard copy maps and posters to the conference and submit them at the conference registration desk at the Zermatt Resort in Midway, Utah on Wednesday, May 8th. If the map or poster is larger than 24” x 36” then you must provide your own foam core board or other mounting material. Online maps/apps: Bring an 8.5 x 11” or 11 x 17″ sheet with a screenshot and short description, including the URL and a QR code. See example. Note: there are websites that will convert a URL to a QR code for free. Register Now for the 2019 UGIC Conference! 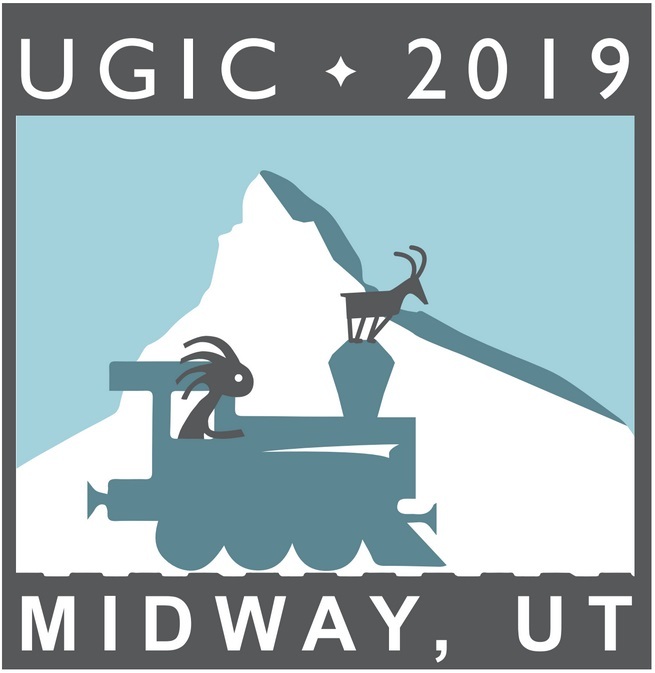 The UGIC Board of Directors is pleased to announce that the 2019 UGIC conference will be held from May 6th through the 10th, 2019 at the Zermatt Resort in Midway, Utah. Located in scenic Swiss-themed village of Midway, this exciting UGIC destination will provide plenty of opportunities for hiking, biking and viewing scenic vistas! Historically the UGIC conference has been an incredible value for attendees who need to maximize every training dollar, and this year will be no exception. Lodging is open now – rooms at the Zermatt are available for the conference rate of $100/night. Please click HERE for reservation information. Individuals are encouraged to identify themselves as part of the group block (UGIC) to receive the discounted rate. The rate is good until 4/15/2019, so please make your reservations before that date in order to receive the conference rate. UGIC Conference registration is $345.